The Felinmor Stud is situated beneath the old Iron Age Fortress of Pen Dinas to the south of the University and market town of Aberystwyth. 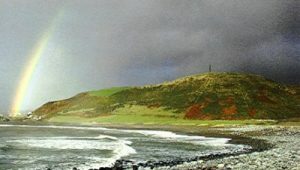 At its highest point Pen Dinas stands at some 120 metres above sea level. The monument built on the south summit is in memory of The Duke of Wellington and was built in the 1850s and stands at some 18 metres high. The site at Pen Dinas is designated as an Ancient Monument with Cadw. The prefix Felinmor (Mill by the Sea) originated from the Water Mill that stood on the site where the stud is now situated and the mill race that took the water to the mill is still to be seen today. 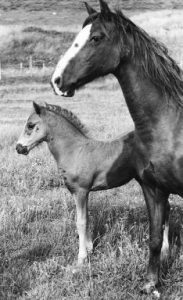 The foundation mare of the stud, WELSH TWINKLE was bred by a gentleman who needs no introduction to breeders of Welsh Ponies and Cobs, namely the late Mr. A.L. Williams of Blaentwrch and the past long-time Secretary of Lampeter Stallion Show. WELSH TWINKLE was born in 1948, sired by WELSH PATRIOT and out of LADY CYRUS who was by CRAVEN CYRUS. TWINKLE was purchased in the late 1950s from the Ministry Farm in Pwllpeirian, Cwmystwyth, near Aberystwyth where she had been used as a shepherding pony. Her “working” career continued in our Riding School where she taught numerous children to ride. Her breeding career began at the age of 15 years, her last foal being born in 1973 when she was 25 years of age. She left us with a solid foundation and many of our prizewinners can be traced back to TWINKLE. In 1984 we purchased STREMDA JET, a black mare by TAYBOG BLACK DIAMOND and out of MOONBEAM by TANFFYNNON TRUSTEE. 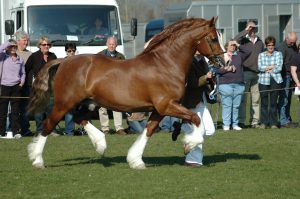 She produced prize winning stock for us over several years and her bloodlines can still be seen today in the show ring. We are a small Stud with a few mares and one stallion, FELINMOR TRIPLE CROWN who has been so successful in hand and under saddle having qualified four times under saddle for HOYS and one visit to Olympia. We have been so fortunate with this wonderful stallion as his temperament is second to none. 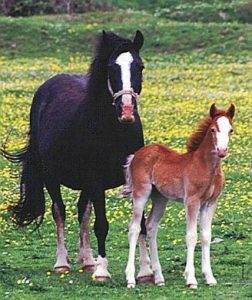 Being a small Stud we do not breed on a large scale but we do have occasional youngsters following on to show and sometimes for sale. The Welsh Breeds are known for their versatility and full advantage is taken of their willingness and fine temperament – there are none better, whatever the Section.